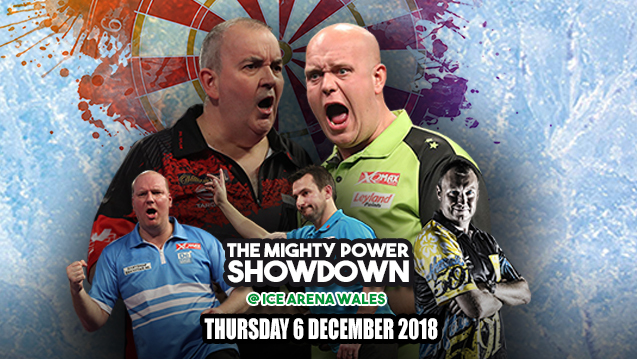 The two greatest darts stars of their generations are set to do battle in Cardiff in December as the legendary Phil ‘The Power’ Taylor takes on world number one ‘Mighty’ Michael Van Gerwen at Ice Arena Wales. The box office bout dubbed ‘The darts duel you never thought you’d see again’ will see 16-time World Champion Taylor take on today’s top arrows ace Van Gerwen in Cardiff on 6 December. The sports supreme duo lead a star-studded line-up, which includes charismatic former professional Wayne Mardle and European Tour champions Vincent Van der Voort and Jonny Clayton. Taylor helped to transform darts from pub pastime to the big stage spectacle it has become today and is rightly heralded as a national sporting treasure having dominated the game over three decades. He announced his retirement following January’s World Championship final but will return to the stage to face great rival Van Gerwen, who has held the world number one position for almost four years. The Dutch ace has picked up over 100 PDC titles, including two World Championship triumphs, as he has emerged to replace Taylor as darts’ dominant force. “I’m really looking forward to playing Phil again,” said Van Gerwen. The event will also see Dutchman van der Voort compete against Wales’ Jonny Clayton, while Mardle will bring his own unique brand of entertainment.